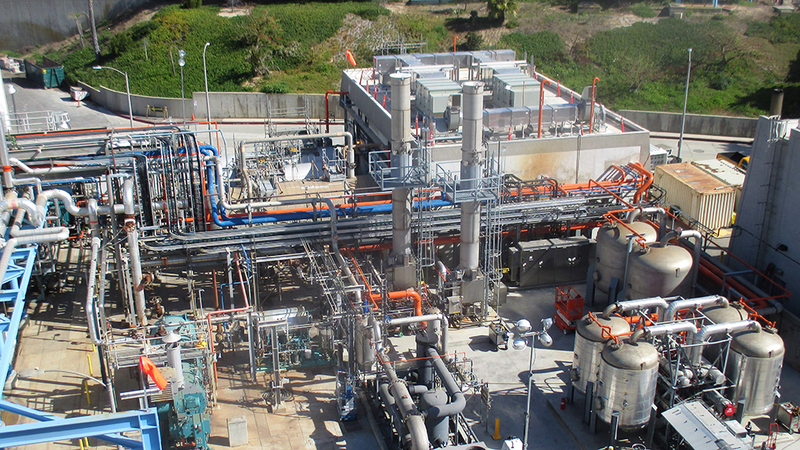 The $127 million Digester Gas Utilization Project is a combined-cycle cogeneration system that converts 7.5 million cubic feet of biogenic digester gas produced daily at the Hyperion Water Reclamation Plant (HWRP) in Los Angeles, California to electricity and steam which is used as the primary renewable fuel source to meet the Plant’s power and heating demands. The implementation of this system reduces the Plant’s carbon footprint and lowers operating expenses as the Plant is able to reduce the amount of electricity and steam it imports for its operations. In order to accommodate this new system, the project team modified the interior of the HWRP’s Energy Recovery Building—a building that has largely sat vacant since the late 1990’s—to house the new equipment for the Digester Gas Utilization Project. The City of Los Angeles’ Bureau of Engineering (BOE) worked in close collaboration with City of Los Angeles’ Bureau of Sanitation (LASAN), City of Los Angeles’ Bureau of Contract Administration and Constellation Energy Group to deliver this award-winning, sustainable project. The Digester Gas Utilization Project supports the goals set forth in the City’s Sustainable City pLAn to invest in the local workforce and reduce unemployment. Both BOE and the LASAN have developed clear and meaningful standards and strategies that contribute to long-term community competitiveness by ensuring the knowledge, skills, and capacity of the community workforce are strengthened through training programs and educational opportunities across all phases of the project, including planning, design, construction, and operation. Also, 30% of the project’s work hours were performed by local residents, 12% were performed by workers classified as traditionally “disadvantaged” (e.g., women and minority groups), and 22% of total work hours were performed by apprentices. Overall, this project exceeded the hiring and training requirements set forth by the City. The purpose of the Digester Gas Utilization Project is to use the full amount of the digester gas produced by the HWRP to meet the electric power and steam needs of the Plant. Digester gas consists predominantly of methane (CH4) and carbon dioxide (CH2) and is produced as a byproduct of the wastewater treatment process. The project generates renewable energy through two combustion turbine generators (CTGs) which have a combined power output of 22.7 megawatts. Additionally, two heat recovery steam generators (HRSGs) capture the exhaust from the CTGs and produce up to 50,000 pounds of process steam per hour. Some of this process steam is diverted to two steam turbine generators (STGs) that generate up to 5 megawatts of power. The CTGs are designed to operate on either 100% digester gas from the HWRP or on a blend of digester gas and natural gas. Natural gas is only used as a supplemental fuel source to meet power and steam demands on an as-needed basis. Conservative estimates based on annual monthly fuel blend averages from April 2017 to March 2018 suggest that the implementation of the Digester Gas Utilization project will result in at least 80% of the electricity needs of the HWRP will come from renewable sources. The project team thoroughly analyzed potential changes in key engineering design variables over the life of the project, and associated traps and vulnerabilities that could impact the project. Resource traps include increasing dependence on resources that could become scarce or expensive, such as natural gas and being reliant upon the electrical grid. A project dependent on natural gas for its operations can be impacted by price fluctuations, for example. Similarly, relying on the electrical grid inherently makes the HWRP vulnerable to impacts of large-scale power outages. The implementation of the Digester Gas Utilization Project helps make the HWRP avoid these traps and vulnerabilities by making the plant more self-sufficient by producing and utilizing a renewable energy to meet its power demands. The project also considers future population growth, variability of incoming flow to the HWRP due to extreme weather conditions, and potential increases in organic content in the influent wastewater. The HWRP captures and repurposes over 100% of stormwater onsite, including additional flow from its sister facility, the Donald C. Tillman Water Reclamation Plant and nearby communities. Low-impact development measures were incorporated into the design of the Digester Gas Utilization Project to reduce the negative impacts associated with stormwater runoff. For example, two new catch basins and a new curb and gutter were constructed as part of the project, all of which are integrated with the Plant’s drainage system. All captured stormwater is sent to the Plant for treatment, some of which is repurposed as treated high pressure effluent (HPE) to be used in numerous plant processes. For example, the Digester Gas Utilization Project uses treated HPE as cooling water for its major equipment instead of potable water.